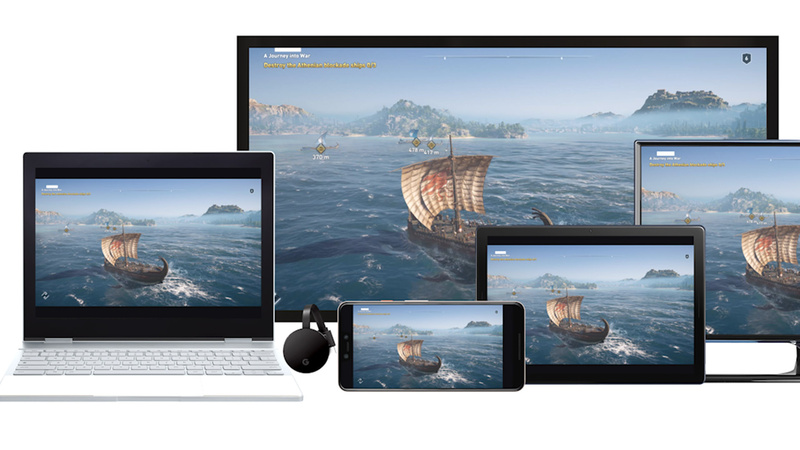 Google announced its ambitious game streaming platform Stadia this week, and it’s a hot point of conversation for the entire industry. But does it represent a paradigm shift in terms of game delivery, and what does it all mean for PlayStation moving forward? Our esteemed editors weigh in. In the cold hard light of day, though, I do have questions. Not ‘what is the meaning of life?’ style questions, but more ‘is this actually going to be practical?’ style questions. Because I’ve been thinking: why would you ever blow 20GB or more of bandwidth streaming a 1.2GB game like Celeste – a Game of the Year candidate, remember – with added input lag. Pretty daft, right? Even if you get beyond the not-so insignificant technological hurdles, like the little fact that the Internet is awful in practically any of the places that ordinary people decide to live, I’m still not sure how the games are going to be monetised. Are we talking a traditional digital storefront model? Subscriptions? Maybe even hourly rentals? Google’s being purposefully vague. But at the same time, I love the concept. I’m particularly taken with this idea that you could theoretically share hyperlinks not just to games, but moments within those games. As the editor of a games website, the idea that you could literally link to an Easter egg or a hidden level or a boss fight is one that boggles the brain – this is next-gen stuff. Except it’s probably not next-gen, is it? I think it’s next-next-gen. Don’t get me wrong, I believe in the streaming future and think it will eventually stick. I reckon PlayStation, in the long-term, is going to become an app. But I think Google’s Stadia is probably going to end up being a product for the future – for the next ten years. It’s interesting to see battle lines already being drawn, though. I think Stadia's given us a glimpse of the future, but I'm not convinced that it's the whole future. The industry has been flirting with game streaming for years now – Sony was arguably the first to take it seriously with its acquisition of Gaikai – but Google clearly wants to establish it as gaming's evolution sooner rather than later. However, I think here in 2019, it's probably a bit too soon. 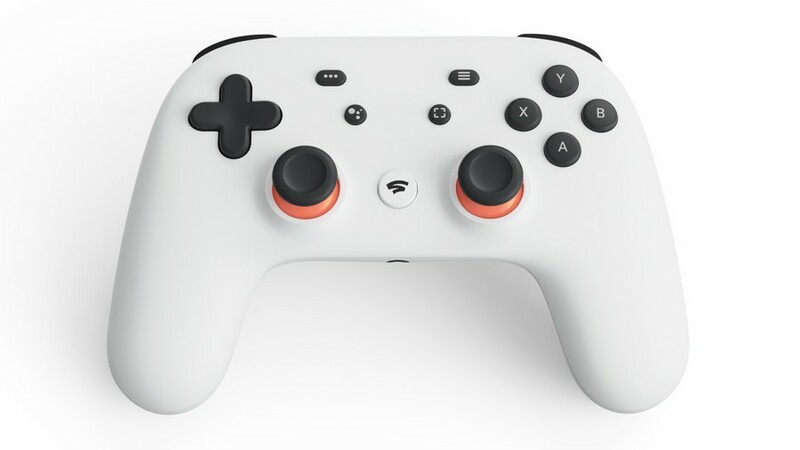 Stadia's an incredibly interesting concept, an idea that Google presented well during its briefing, but for me, that's ultimately what it boils down to right now: an idea. There was a lot of tiptoeing around key details like the minimum Internet speeds that Stadia will require, and we were even left guessing on how much the service will cost. No doubt all will be revealed later this year, but in my opinion, the whole thing's up in the air until we know for sure that it actually works. From a PlayStation perspective, you've got to wonder whether streaming will play a larger role than we anticipated when it comes to the PS5. 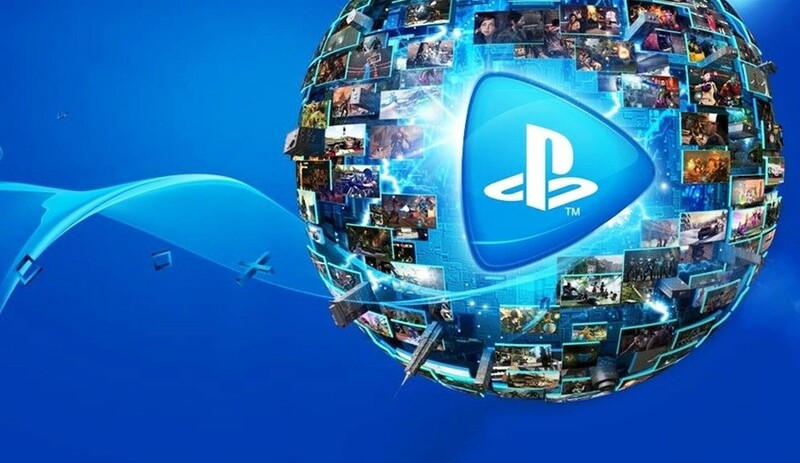 While I don't believe for a second that Sony would transform PlayStation into a pure streaming platform any time soon, I do think that with the reveal of Stadia, Sony could well be looking to push services like PlayStation Now harder than it had initially planned. Whatever the outcome, Stadia's announcement has made the inevitable PS5 reveal that much more interesting. Is Stadia a direct PlayStation competitor? Not yet, I don't think – not until the PS5 hits. Stadia struck me as the first "next-gen" announcement, and if anything, I think it'll be compared to the PS5 and the Xbox One's successor. But then you could argue that Sony and Microsoft are in a better position to begin with. Both companies already have recognised consoles that provide traditional gaming experiences, and I don't think the market at large is ready to part with that for at least another five to ten years. All in all, Stadia's got a lot to prove. The video games industry is a notoriously tough nut to crack, and Google seems to be brute forcing its way in by saying "hey, this right here? This is the future". The thing is, I'm just not sure everyone is willing to listen – not yet, anyway. 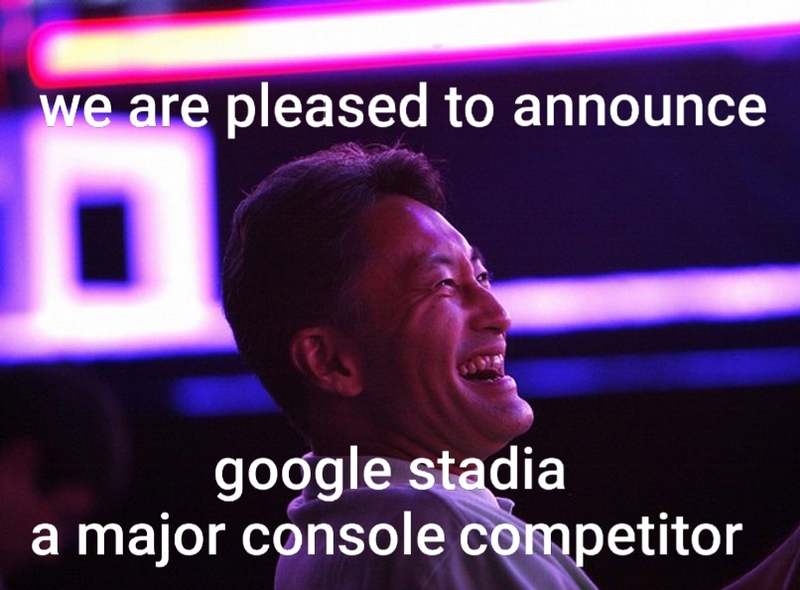 Stadia is a brilliant idea. Google has presented us with a strong pitch that gives a tantalising taste of the future. The thought that games could become as accessible as clicking a link in your browser is fascinating. It feels like the next logical step for streaming games, which is something we're able to do right now, but what's being promised with Stadia certainly takes things up a notch. Even the idea that the controller speaks directly to Google's servers over WiFi with no middle man to reduce latency is a big step forward. However, this forward thinking vision is maybe a little ahead of its time. Anecdotally speaking, there's no way I'd be able to take advantage of Stadia in the near future. Some parts of the world have great online connectivity, but if you happen to live somewhere that doesn't – or you can't afford decent broadband – it seems highly unrealistic. Instant access to games is exciting, but if your connection can't keep up, your experience is going to suffer. Currently, downloading huge game files might be time consuming, but at least there isn't any lag between you and the game itself. It's very difficult to judge how this announcement will affect PlayStation, although I suspect Sony has been looking at similar technology as it develops PS5. I could imagine a scenario where Stadia-like streaming is integrated into PS Now, providing members with the benefit of buying and instantly playing brand new games with no download to worry about. Perhaps for everyone else, content will still be available to purchase in the traditional way. Google's platform isn't going to make consoles obsolete in the short term, but it could well pave the way for where video games will go later down the line. Ultimately, Google has left so many question marks, it's hard to pin down exactly what I think. As of right now, I'm not sure the world is as prepared as Google wants it to be, and that's the kicker. We'll have to wait and see exactly what the tech giant expects of players to achieve a smooth gameplay experience, but I can't see it being attainable for the majority. As my colleagues have said, it feels like a concept ahead of its time. Eventually, I can see games go down this road, but it just doesn't quite line up in 2019. 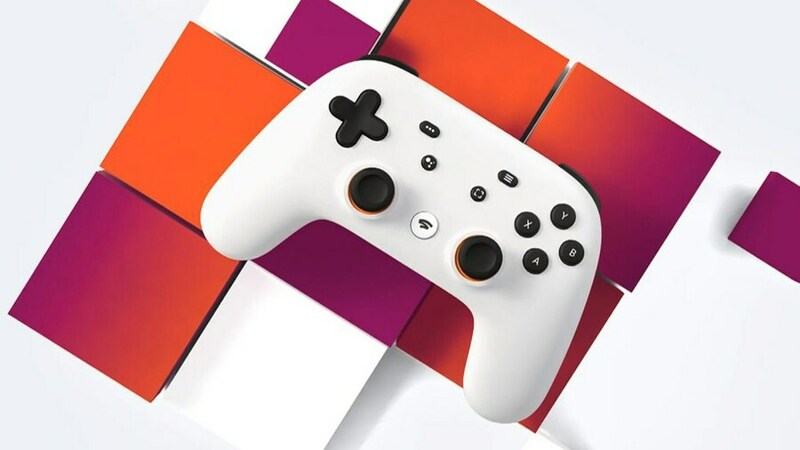 What are your thoughts on Google Stadia now you've had 24 hours to get used to the idea? How do you think the new initiative will affect PlayStation? Stream your subconscious into the comments section below. Seeing that guy yesterday demonstrating AC Odyssey and having to press the A button three times before the character decided to climb up the chimney really makes a person want to just run to the store and buy one right away, ya know? On a serious note, maybe Sony will look to improve PS Now to make it more appealing to people that invested in their PS4s (and the PS5 in the future). I just don't see it taking off because of the lack of fast enough internet service being readily available to people. I don't want to play a game where I have constant buffering, input lag and the game going from 720p to fuzzy 480p every 20 seconds. It might take a small chunk of sales off PS5, if that. If it's still around in two generations time it could be a major force. so next gen is still safe for PS fans. plus they promised that they will always have traditional ways to play their games in a interview about streaming. the generation after that i don't know but that is still years away so i don't want to lose my mind over something so far away. just a little note about it:even the people that want this most likely won't be able to get it because bad internet. aslong as that is still a problem,streaming games will never take off the way google and all the other bubble dwelling people want it to. it's a project that is around 10 years to early. At Cornell University, they have an incredible piece of scientific equipment known as the Tunnelling Electron Microscope. Now, this microscope is so powerful that, by firing electrons, you can actually see images of the atom, the infinitesimally minute building block of our universe. If I were using that microscope right now, I still wouldn't be able to locate my interest in this service. 1. With Google's shady practices, their devices aren't welcome in my house. No thanks. 2. I like to play my games on the biggest screen possible ( those handle held days are over for me/born in 94). No thanks. 3. These companies are foaming at the mouth to cut out the middle man (gamestop (trade ins for a few extra bucks)/ ebay for killer deals & etc) & have full control over their prices and software. No thanks. i like to drop a few bucks on an upcoming new game here and there, no way am i'm dropping a full $60 plus tax all in one go.. I just gotta say, I had a fantastic dentist do my root canal and he did such a good job I’d happily do it again. @youreyesonly00 you’re correct, that is a bit extreme. Perhaps compare it to using Spotify instead of trudging down to a Virgin store. Or I dunno, using a video game website instead of a magazine. Once streaming naturally becomes the most viable option, people will gladly take it on as their preferred way to play video games. We will see these at the swap meet in a few years for $5. @kyleforrester87 What gave me away? Show me a world with consistently stable, guaranteed super-fast broadband reaching every home in every country across the globe, and I'll show you a world in which this is a good idea. As is often the case with these "forward-thinking" ideas, it'll work perfectly for those living in the Silicon Valley bubble. It will make people think PlayStation is the way to go? I just hope Sony keeps pushing traditional gaming and VR, the cloud being only an option. Plus, this is Google we're talking about. The other day, my partner and I were watching 24 and we randomly made an off-hand joke about a particular scene looking like a United Colours of Benetton advert. His phone was on but locked, not being used at the time, and neither of us said any permutation of "Okay Google"... and yet, when he went to check the headlines later, all the adverts on every web page he looked at were for (yep, you guessed it) United Colours of Benetton. I don't wanna accidentally kill a chicken in Rise of the Tomb Raider and suddenly get bombarded with coupons for KFC. Streaming games, I've no interest at all. The bright future where you own nothing you can trade or sell. @RogerRoger well, 30 years ago I could have shown you a world with no internet at all, and 15 years ago a world that took several hours to download an MP3 - we’ll see what the next 30 bring. Of course, we all know that it’s not a requirement for “the world” to have such an internet connection as you’ve described, just enough of the world for the delivery method to be cost effective. Give it 10 years. Can anyone tell me how this is a competition for Sony ? They need exclusive titles for them to make it appealing for people. People buy Nintendo for the Zelda and mario, Xbox for halo and gears and Sony for there awesome exclusives. Plus I don’t want to give up on my physical copies of the games. I just hope that this not the direction Sony will go next gen I’ll be dam if they do. it won't do anything imo & I think Google are so up themselves! they have done jack in this industry & then try & say the console is not needed anymore 😡us as gamers will decide that we have more power than we realize look how quick MS Online only console got shot down. I'm fine with having a console & other options available but just streaming I hate the idea. @kyleforrester87 Oh sure, everything's constantly evolving. Personally, I think you're being a tad conservative; I'd give it shorter than ten years, but I'd also definitely give it longer than "Coming Q4 2019". Just look at the PlayStation4 right now; you've got about 49% physical sales, 49% digital downloads and 2% on PS Now. You can say "build it and they will come" as much as you want; it's been built for years, and nobody's showing up. It's the Millennium Dome all over again. But then that's okay, because they can rework the technology into a music streaming platform when it doesn't quite pan out. @Tasuki See what at swap meets? This isn’t a console, it’s all integrated into Google’s pre-existing services. That’s where the magic lies, it’s a lot cheaper up front than hardware. Then again, the cost of good internet probably balances that out. I agree that it's the future and think it definitely throws a pretty interesting curveball at PS5 and whatever Xbox do next. Of course Sony have a history of fantastic exclusive games so their brand isn't gonna go away any time soon but it's an exciting time for gaming imo. Let's say early next year, If PlayStation are trying to flog a £400+ console and there's an alternative option out there where you can play most of the same games just by using a link in a web browser, that's gonna be a hell of a difficult sell in the long term. @RogerRoger well that in itself is a good point, digital sales themselves now match physical so it’s an example of how delivery methods can naturally evolve. Some people still hate digital but on places like this people who spoke about it in the past similarly to how they now speak about streaming are happily downloading away. Of course none of us can predict the future, but looking at how other media services have evolved it seems like the logical next step. I believe just “not liking the idea of it” won’t be enough to stop this train. I think PS5 will still be the best way to play games going in to next gen. Stadia sounds good in theory, and certainly seems to offer benefits, but the negatives outweigh those at the moment. I am more interested in what MS is doing with xCould. It seems like xCloud will supplement Xbox, or could be an alternative for some people. The flagship version of the games would be on Xbox One X or traditional gaming PCs, but I could stream to my phone/tablet or Roku on the bedroom TV when the wife wants the main TV. That would offer more value to me personally, if I had the go anywhere capability of Stadia to supplement my traditional console. Not a single gaming site nor a single games reporter is willing to talk about the real killer feature here, the real potential. Yes, it's a few years away but once google/amazon/MS or Sony tell you what it is every gamer will be throwing their money to get it. I don't like the whole concept though, but it will be unbeatable. @Neolit untill they realise that the money got wasted because their internet can not compute with the service. i mean even sony said that they want to keep traditional gaming around because not everybody will be able to stream games. streaming will always be beaten by a service that actually works for most people AKA traditional gaming. remember that altough movie and music streaming are popular,streaming games is a whole other league. plus it's not for nothing that vinyl records are getting more and more popular again. the best option would be to have streaming as an option. systems that only offer streaming will always be outsold by systems that offer other ways to play games. If it allows the creation of unique experiences that wouldn’t be possible locally then I will probably use it for them (assume you’re buying games individually and it isn’t a subscription service). But if I have a choice between having a game locally and streaming it I would always choose to have a game on my local hardware. If third-party do create unique experiences that aren’t possible locally I wonder whether some of them could turn up on PlayStation now even if they weren’t available on any PlayStation locally in the past. @kyleforrester87 Completely agreed; I just think it's a tad early, s'all, and so I have zero current interest and reckon Google will draw all the fire for going "first" (the Ouya and PS Now don't really count; one was essentially an indie start-up, and the other is a small, kinda experimental part of a much larger, pre-existing infrastructure). It won't impact the known-knowns (PlayStation5, XboxTWO) but, if it isn't a total dumpster fire, it might start to sway the known-unknowns (PlayStation6, XboxTHREE). Many have said this already, too, so my thoughts aren't entirely original. Neither was my microscope quote. It's from Frasier. "I reckon PlayStation, in the long-term, is going to become an app"
@get2sammyb Do we really want that though? I still get buffering watching 10 second Youtube vids so I'm definitely out. Im more interested today in what the implications of cuphead going to switch are with xbox live integration. This is a massive deal. Clearly the two are starting to work together and it will be interesting to see what happens next! Does Sony have the infrastructure to compete with Google and Microsoft when it comes to streaming? Genuinely curious if anyone has an idea. Considering how MS and Nintendo are doing lots of deals lately (see Cuphead), perhaps Sony should start looking for a friend. Maybe that's why they let Quantic bring those games to the Epic store. Personally I'd like to see them get in to bed with Amazon/Twitch, and re-brand PS Now as PS Prime, then take advantage off all of Amazon's infrastructure. Just a thought. As for Stadia, I still think we're overreacting to this like we always do. Like how mobile will kill console or how Kindle will kill books. In the end we had expanded markets with demographics for both. At most Stadia will create a new demographic. It will be popular, no doubt, but it's not killing off our physical games or our digital downloads, not while there's demand. 100 years from now folk will all be in the Oasis playing virtual Atari 2600s anyway. Pretty sure there's still a high number of " Download YouTube videos" searches going on even though people easily stream videos, so yea people still wanna download, keep it and not be constantly greeted by ads anytime they wanna access it. It's not going to have much effect on Sony in the short term. Maybe they'll push PS Now a bit harder, but that's about it. Many people just won't have a good enough internet for streaming at 4K 60Hz. Slow or unreliable connections and data caps are big problems for streaming. There's also the possible input lag. Even a split-second delay will be a big problem for many games. Then there's the issue of game ownership. As you don't own the games you play on a stream service, they could easily be removed from it at any time. Having the disk (or even buying it digitally and then downloading it) will generally allow you to still play it years from now. Streaming might be the way of the future, but non-streaming ways of playing games will still be around for a long time yet. I'm not going to switch to a game streaming service any time soon. @AdamNovice Not really, but it's going to happen. if i was google. Offer both physical & streaming services, adopt the trade in ecosystem of gamestop, that's enough to have people shivering in their boots..
@JJ2 ability to scale computing power seamlessly, on the fly, from a workload that gives the equivalent of whatever is the leading console (e.g. PS5) to 20 or 30xps5. In sustained delivery or in short bursts depending on what is happening in the game. It will be a totally different ball game for consumers AND developers. Games developed specifically for that type of a platform will be almost impossible to replicate on a home system (yes, even on a super duper PC). @Shepherd_Tallon in worldwide distributed data centres arena there are only two major players. MS and Amazon. Google is way behind but they are trying to catch up. Sony is not in that league at the moment. @get2sammyb If the was advertising revenue to be had would you put a stadia link at the bottom of an article where you were discussing the game? @Ryall Don't know. Interesting thought. @get2sammyb Only if consumers allow it. seriously, would anybody play assassin's creed odyssey on a 5-inch smartphone screen?!?. 4K/60fps would need about 72gb of data for 8 hours, so if you played 8hrs per day for a month, that's more than 2Tb of download, for a game that's at most a 50-100gb install. it just seems incredibly wasteful to me. and the days where infrastructure in the UK is such that 2Tb/mth for most of the population is feasible is more than a decade off, imo, there'll be much bigger priorities than ensuring widespread coverage of megafast fibre cables. @jdv95 see my previous post on why this way will matter. Probably not until ps5 is retired. But we just witnessed the beginning. Vinyl is getting more popular because it's hip, not because people appreciate the fullness of the sound, and by the way, with a proper equipment these days you can achieve the same if not better quality with digital lossless format. Speaking of vinyl, it got destroyed by a lesser not a better carrier (audio tape, a.k.a. cassette tape). And then came CDs. And people were poopooing on that as well but it was way better than the cassette. We thought for a moment, well at least we are getting back to better quality, but nooo, all that was destroyed by utterly disgusting mp3. Whole generations were born and are living who never heard anything better than THAT. What I'm trying to say is: lag free gaming may not be enough to save consoles because only old farts will care. Technically it's a great concept. Hardware performance will be always greater (and possibly many times) than a fixed console, and upgrades/generations are gone. From end user perspective, it's almost like magic. Sounds too good to be true. You can tell that this is going to be revolutionary... Until you factor cost and connectivity. I do think this is the future of gaming (and maybe the near future if you can handle bandwidth etc), but the future-future for most of all gamers . Relying on a (super) connection to be able to play ALL your games ALL the time, seems like ... not going to happen anytime soon. It surely will have it's hit as a niche product and a taste of what's to come. And as someone else pointed out, in the demo you can see the controller being smashed while the character on the screen did nothing... I bet that is what I will get in my house using Stadia in 5 years from now. So maybe PS6 is in danger. Nowadays I couldn't care less for Stadia, but it's impressive from a technical point. @Neolit like... "In my times we didn't had lag... Lag was for fools... Now people are used to this garbage... 16K HDR streamlagged Tetris..." Yes, I could see it coming. Also, with touchscreens I've also thought "whom in hell will play games touching a screen..." So, in the end it will happen, and some people will be still buying vinyls and PS5 just because of the old times. Stadia is like driverless electric cars. It's the future but won't be ready for a long time. My broadband is fast. It's not fibre fast, but it's 40MB fast, with super low contention rates and fast upload. I still get perceptible lag on PS Now games. The screen still suffers from compression artefacts. At 4K? 60FPS? Not likely. Until somebody can prove that's not an issue? Game streaming is a hard pass. Can streaming be as fast as a physical gaming platform? I believe so. Why? Cos at one point in my life I also scoffed at the ability to stream 4k movies. 6 years ago I thought broadband wasn't capable for the price I was paying. But now I stream 4k movies into my home on £25 broadband without a single pause or glitch. You heard of 5g right? Well that's gonna change things. Mobiles will download 20x faster than 4g. But will broadband sit still? Course not. Broadband has also gotta increase. Both sectors want our bucks. So in short, 5g will begin our next evolution of streaming tech and new chips are being made right now to fit into smart tvs, mobile phones, modems, warehouse servers, AI cars, etc. Next gaming era is gonna change I'm guessing, like the huge change from 2D to 3D. 5g enabled wireless VR glasses, super WiFi embed consoles and PCs, 4k/HDR as standard, always on social media across multiple game accounts, instant access to watch a buddies game live without pause or streaming glitches,etc. @Neolit Food for thought. Thanks for the answer! I have no interest in it, I'll be buying a PS5 when it's released. The second every console manufacturer goes to streaming games instead of disk or download that’ll be the day I hang up gaming for good. Don't think it really can, the cloud gaming platform will heavily relied on the Internet speed, and there must be some delay. Oh its google. I cant shake the feeling they mighta made this just to surveill me, so as usual with them I will keep this far away from my home. Before I state my opinion I'm going to go ahead and tell you right now that I am the "only physical gamer". With that said, I will be honest when I say that streaming games is the future. And I hate it. However, this is a major company (whether it be Google , Sony, Nintendo, Microsoft, etc) laying the framework for what is the future. Someone had to do it. This will be tweaked over the next ten years to make it a more "accessible" way of gaming. And trust me. Google will find a way to profit from it, for years to come. The potential is this can effect every game platform including Steam and PC games. With out knowing any of the consumer details such as content and price its impossible to say. Streaming is irrelevant, If you can stream Netflix you can stream Stadia. Stadia could do just as well if the streaming was free, by retail sales of games maybe even better than selling the streaming alone. Knowing Google Ad revenue will be a part of the service. When 5g cable infrastructure becomes the norm in every home... it may just work. Good ol'Phill Harrison though. That guy has worked for every major platform holder since forever. I really hope I'm wrong because this Stadia thing sounds awesome, but come on. Sounds WAY too good to be true. They seriously expect me to believe just by buying their controller I can play PC QUALITY games on my smart TV and phone? Lag free? Did they even say anything about the quality of the games as far as low, high and ultra settings go? Yay, 720p streaming on my new 50" 4k TV. Knew there was reason to buy it! All the talk about how fast google server is useless when most of internet users only have average connection speed. And the most important thing is the price, server is expensive, who will the pay the cost of server for streaming games 24/7, if the game is not selling will google kick the game out of this server, and last, how much this service cost, it's a doa if we have to buy the game full price. I don't really think it's going to affect PlayStation much at all in the short term. I think we - i.e. people who care enough about gaming to come on sites like this - need to remember that we're not the general public, and what we think, and what we get excited about, isn't the general consensus. Internet connections strong enough to deal with this aren't ubiquitous, and data caps are still rampant - crazy, I know - limiting how many games someone could theoretically play, or how well they'd function. We've been shouting on about the digital revolution for what feels like an age. Remember when the next console generation was going to be the last one ever, and hardware was doomed? That was before the PS4 launched. Adoption is always slower than people think it will be. Look at music - it tooks years for digital to take over - long after it was predicted - and people are still buying vinyl. Streaming is undoubtedly going to be a part of the future, but for a long time it will only be a part of it, and so with Stadia not offering any physical options, I really don't see it harming PlayStation much in the short to medium term. I reckon companies have to push ahead - even if gamers are saying they don't want change. That's how progress happens. It's like Ford said: 'If I'd asked people what they wanted, they would have said "faster horses"'. @kyleforrester87 Well, digital sales does include digital-only indie games, DLC, micro-transactions, etc. You don't have the option to buy those physically. Just looking at games, you'll find that more people still buy physical today. @Octane no doubt but it’s still an indication that people are more open to owning a digital gaming library than they were. As streaming technology gets better it’ll go the same way. Physical obviously won’t go anywhere until such a time as PlayStation becomes an app (which I too think will happen) but digital and streaming will only increase in the meantime. @kyleforrester87 I think I'm going to hoard every game I want and sit out the final days alone with my old consoles. I figured that my library is enough to replay everything every 10 years or so without everything getting too repetitive. By the time I'm 80 dementia kicks in, and it only gets easier from there on out. I'm prepared. Come at me Google! *Replace Johnny with "streaming as the future of video game delivery"
I think it could be awesome if done right. I'd happily pay £10 per month to have all games at my finger tips, in a similar fashion to Spotify for instance. The downside would be, if they play it along the same lines as PS Now whereby you get kicked off if there is like, 5 minutes of inactivity. That wouldn't suit me whatsoever and would be the deal breaker. Good shout, I'm thinking along those lines, thank goodness I have such a large back catalogue to play. I was getting worried with the PS5 looming with all the games I've bought out of impulse but not started yet. Never trusted Google, never will. Throw them and Facebook into a volcano, please. I am not entirely sure this is all that exciting. What is the underlying difference between this and NVIDIA's game streaming service? I can go on and purchase any game through steam and then stream it through my NVIDIA Shield Tv box. Alternatively I can play on a computer or on an NVIDIA tablet. I don't think Google are offering anything too revolutionary. Also PSNOW is playable on multiple devices. Maybe I am just not quite understanding what is on offer here? I like Google as a company. I'm just not interested in streaming games. I don't think consoles have anything to worry about. Personally I'm looking forward to PS5 and couldn't care less about streaming game services. It won't cause Sony is doing the same with PSNow. It won’t, because there are countries, like here in Germany, where internet technology still seems to be prehistoric. "Once streaming naturally becomes the most viable option"
So, 2039 then? If ever. Sammy's first argument should be enough to convince anyone of how stupid this idea is: "why would you ever blow 20GB or more of bandwidth streaming a 1.2GB game like Celeste [...] with added input lag". And that's Celeste, a pixel-styled 2D game. Imagine streaming a so-called AAA title in 4K/60fps, as they claim to be possible. Even internet providers would have to improve their infrastructure in order to something like that begin to become viable. You may feel safe in relying on "the cloud" (which is just a fancy name for the internet) for your every need, I'll keep my stacks of physical media and terabytes of locally installed crap, thank you very much. @makoshichi no problem, and good luck with that! @Deadlyblack People were saying the same thing about "internet not fast enough," 20 years ago. Point being, it WILL get faster. This effort is setting the the ground work for when that time happens. My guess is people won't notice that higher speeds are "here" for another 10 years. That doesn't mean in in exactly 10 years a magic switch will suddenly make everything faster. Progress will be going in that direction and when it "arrives" most people will wonder, "how did we get here?" Its all gradual. Looks like absolute garbage. Googles track record with hardware is atrocious. Google glass anyone? How about a Chromebook, oh,wait, they just discontinued them. Combine that with how they treat people’s data and this is as hard a pass as you can get for me. @Hordak Could not agree more. Both of them are complete garbage.